​We recommend you carry out a FeL-V/ FIV test on your cat or kitten before it arrives. We only recommend testing through IDEXX as detailed below with their permission. Sensitivity and specificity are based on visual interpretation of SNAP® test results. Study shows the Abaxis® VetScan® Feline FeLV/FIV Rapid Test and Zoetis Witness® FeLV-FIV Test demonstrate poor sensitivity for FeLV antigen. Test sensitivity is a key factor during this stage because it allows identification of cats early in the course of infection and limits transmission of the virus. Poor test sensitivity could delay supportive care and result in transmission of the virus to casual-contact naïve cats. IDEXX Laboratories conducted a study to determine the sensitivity and specificity of three in-clinic diagnostic tests for FeLV antigen. Study design Samples from 137 cats used in this study were random samples submitted by veterinary clinics to IDEXX Reference Laboratories and tested for the presence of FeLV antigen. 87 FeLV-positive samples and 50 FeLV-negative samples were identified using a PetChek® ELISA, which included both screening and confirmatory protocols. The SNAP Feline Triple Test is highly sensitive and specific for detecting FeLV antigen in cats. • The Zoetis Witness FeLV-FIV Test was found to be less sensitive for FeLV antigen detection than the SNAP Feline Triple Test. Almost 1 in 5 positive samples would be missed on the Witness FeLV-FIV Test. • The Abaxis VetScan Feline FeLV/FIV Rapid Test was also found to be less sensitive for FeLV antigen detection than the SNAP Feline Triple Test. Almost 3 in 10 positive samples would be incorrectly called negative on the VetScan test. Optimal test sensitivity allows for early supportive care and helps to prevent transmission of the virus to naïve cats. 1. Hartmann K. Feline leukemia virus infection. In: Greene CE, ed. Infectious Diseases of the Dog and Cat. 4th ed. St Louis, MO: Saunders; 2012:108–136. 2. Levy J, Crawford C, Hartmann K, et al. American Association of Feline Practitioners’ feline retrovirus management guidelines. J Feline Med Surg. 2008;10(3):300–316. 3. Lutz H, Pedersen NC, Theilen GH. Course of feline leukemia virus infection and its detection by enzyme-linked immunosorbent assay and monoclonal antibodies. Am J Vet Res. 1983;44(11):2054–2059. 4. Hartmann K, Griessmayr P, Schulz B, et al. Quality of different in-clinic tests systems for feline immunodeficiency virus and feline leukemia virus infection. J Feline Med Surg. 2007;9(6):439–445. 5. Hartmann K, Werner RM, Egberink H, Jarrett O. Comparison of six in-house tests for the rapid diagnosis of feline immunodeficiency and feline leukaemia virus infections. Vet Rec. 2001;149(11):317–320. 6. Goldkamp CE, Levy JK, Edinboro CH, Lachtara JL. Seroprevalences of feline leukemia virus and feline immunodeficiency virus in cats with abscesses or bite wounds and rate of veterinarian compliance with current guidelines for retrovirus testing. JAVMA. 2008;232(8):1152–1158. 7. Lappin M, Thatcher B, Liu J, Bewsey H, Beall M, O’Connor T, Chandrashekar R. Evaluation of three in-clinic serological tests for specific detection of FeLV antigen in cats. Paper presented at: 58th AAVLD/119th USAHA Annual Meeting; October 22–28, 2015; Providence, RI. 8. O’Connor TP, Lawrence J, Andersen P, Leathers V, Workman E. Immunoassay Applications in Veterinary Diagnostics. In: Wild D, ed. The Immunoassay Handbook: Theory and Applications of Ligand Binding, ELISA and Related In-clinic test Sensitivity Techniques. Oxford, England: Elsevier; 2013:623–645. What is the SNAP® FIV/FeLV Combo Test? The SNAP® FIV/FeLV Combo Test screens cats for feline immunodeficiency virus (FIV) antibody and feline leukemia virus (FeLV) antigen. What does a SNAP FIV/FeLV Combo Test result indicate? To determine the test result, read the reaction spots in the result window. Any color development in the sample spots indicates the presence of FIV antibody or FeLV antigen in the sample. If no color develops in the positive control spot, repeat the test. I ran the SNAP FIV/FeLV Test and received a light positive on a spot. Does the color intensity of the spot mean anything? Any color development in any of the sample spots indicates a positive result. Which types of samples can be used on the SNAP FIV/FeLV Combo Test? Serum, plasma or anticoagulated whole blood (e.g., EDTA, heparin), either fresh or stored at 2–8°C for up to one week, can be used. I used the incorrect conjugate/sample ratio. Can I rely on the results I received? We recommend rerunning the test with the exact ratio of conjugate/sample listed in the package insert—3 drops of sample and 4 drops of conjugate. What is the read time for the SNAP FIV/FeLV Combo Test and is it really important? The test result must be read 10 minutes after the device is snapped. The test does not contain stop solution, and after 10 minutes, color development may occur that is not related to the sample. Do not report results read after 10 minutes. How do the kit components need to be stored? • Store at 2–8°C until expiration date. • All components must be at room temperature (18–25°C) before running the test. Do not heat. My SNAP FIV/FeLV Combo Test has been out of the foil package for the day. Can I still use it? The SNAP FIV/FeLV Combo Test, and any other SNAP® test, must be used within two hours of removing it from the foil package. 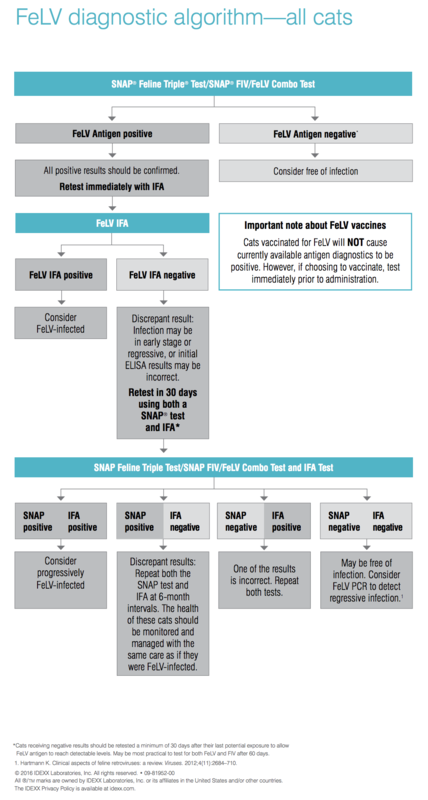 Can my SNAPshot Dx® Analyzer read the SNAP FIV/FeLV Combo Test? Yes, the SNAPshot Dx Analyzer can read the SNAP FIV/FeLV Combo Test. Can the SNAP FIV/FeLV Combo Test be used with SNAP Pro® Mobile Device? Initial testing/ Cattery admittance testing should be repeated after 30 days for FeL-V and 60 days for FIV after the initial test and annually for cats kept in long-term group housing. Ask for the initial test result taken within 2 days of the kitten leaving to come home with you. Isolate for at least 30 days before the retest for clearance. Every single one of our kittens leave with a blood test to confirm negativity.